Jakarta, September 15th 2015 - The favehotel MT. Haryono Balikpapan, a leading hotel with a modern minimalist design concept, today announced its partnership with Taxi One, a major local transportation service company in Balikpapan. The partnership offers guests of favehotel MT. Haryono Balikpapan a complimentary pick up service from the Sultan Aji Muhammad Sulaiman Sepinggan Airport, direct to the hotel. This complimentary service is gifted to guests who make prior reservations at favehotel MT. Haryono Balikpapan via direct, online or website bookings. "Many hotels in Balikpapan offer great quality services and facilities, but to stay a step ahead of the competition, one must come up with something different and useful for guests to enjoy during their stay. This complimentary airport transfer service is designed to add value to our guests' stay, to ensure a pleasant arrival at favehotel MT. Haryono Balikpapan and to begin each visit on a stress-free note." said Mr. Rahmat A. Santoso, Hotel Manager of favehotel MT. Haryono Balikpapan. The favehotel MT. Haryono Balikpapan has been designed from a guest’s perspective and is ideal for business people, tourists and families. It offers easy access to local attractions, such as Kemala Beach, Melawai Beach, and the Teritip Crocodile Breeding sanctuary. The uniquely designed, value hotel with its fun atmosphere, fresh attitude and friendly service is surprisingly different and destined to become the favorite choice for smart, budget-minded travelers to Balikpapan. 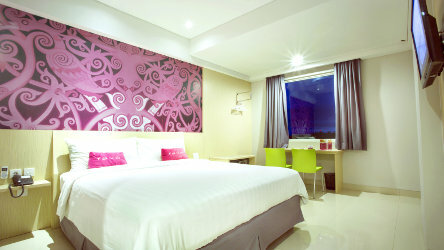 Seen in the image : Superior Room at favehotel MT. Haryono Balikpapan. Seen in the image : A guest is enjoying free pick up facilities from the Sultan Aji Muhammad Sulaiman Sepinggan Airport to hotel provided by favehotel MT. Haryono Balikpapan.